Costway Portable Fridge Freezer - How Does it Compare? 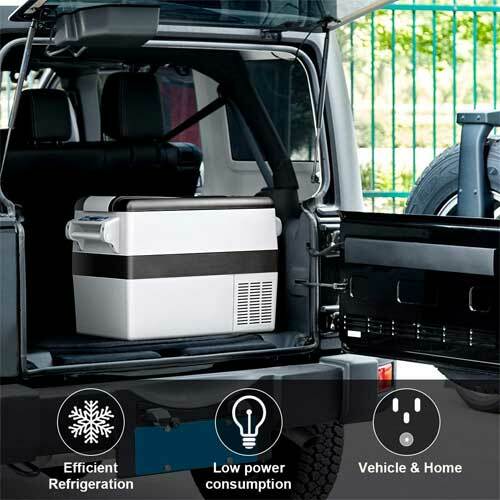 Do you want a compact refrigerator-freezer that you can take on road trips, camping or for van living? Check out the high-capacity Costway Portable Fridge Freezer that is narrow enough to fit in space-restricted areas. Compared to extra large car coolers, the Costway 54L has more versatility as far as where you can fit it. In addition, it cools faster and costs less to operate. Not to mention, it can save you a few hundred dollars because the price is lower. 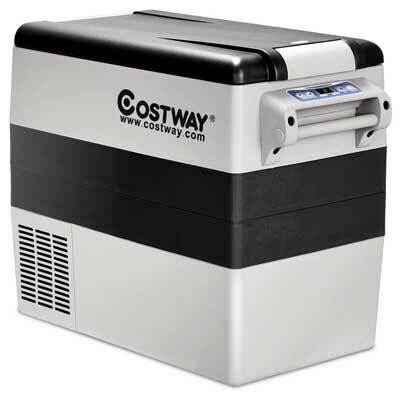 Therefore, if you don’t need a giant cooler yet need the ability to both chill and freeze, Costway provides a practical option. By the way, this portable fridge/freezer is not small by any means. For example, it can hold about 75 12-ounce cans. Furthermore, many smaller, personal-sized car coolers don’t have the ability to reach a freezing temperature. Again, the Costway 54L provides a viable alternative. Not to mention, the additional space makes this unit more multi-functional. For instance, family camping trips, tailgaters, larger parties or picnics, keeping medicine cold or storing fishing supplies. Note: If you didn’t already know, Costway makes lower-priced products. Therefore, you can save a bunch of money. However, you may give up performance or special features. For instance, a ARB makes a similar style 50 Quart refrigerator freezer that costs twice as much. 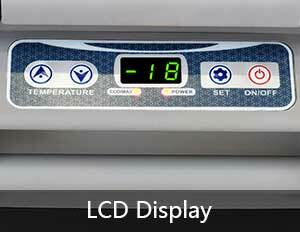 It has thicker insulation, better cooling performance and with less power consumption. In addition, the Dometic CFX 50 costs almost $900, whereas the Costway comes in under $400. This model also runs very efficiently, plus it includes a USB port, corner protectors and more. 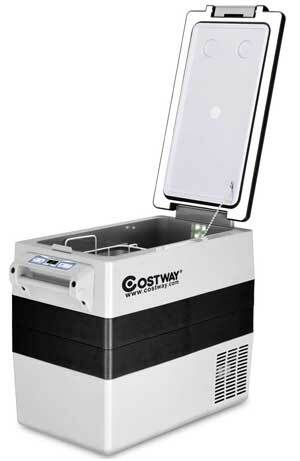 Costway gives you a few options when it comes to chilling your food/drinks. First of all, you can use the “Max Mode” for 30-minute fast cooling from 90°F to 32°F. This, of course, uses more power but saves you time when you need cold drinks quickly. Alternatively, you can choose ECO mode to save energy and minimize power consumption. As you can see, the Costway portable fridge freezer comes with convenient carrying handles on the sides. The long flip-up top also works well in tight narrow spaces. Plus, it has an interior light which comes in really handy at nighttime where lighting is limited. For instance, when you go camping. Speaking of camping, if you plan to drive off road, this cooler was built to withstand bumpy road conditions. 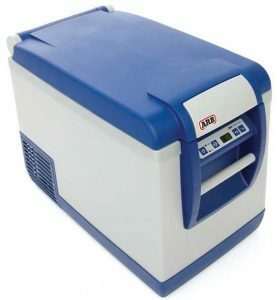 Note: By the way, if you don’t care about the freezer option, Knox makes a 48 Quart cooler + warmer. I bring up this option because it costs about 50% less than the Costway. Knowing your options is always good, right?